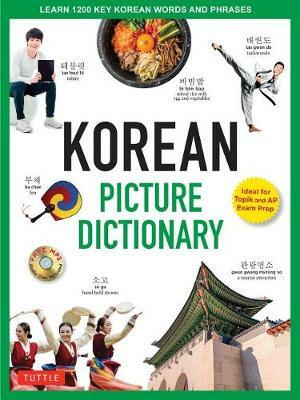 This Korean picture dictionary covers the 1,200 most useful Korean words and phrases.Each word and sentence is given in Korean Hangeul characters with a Romanized version to help you pronounce it correctly and the English meaning. The words are grouped into 40 different themes or topics. Each theme has around 30 words and several example sentences showing how the words are used. Each page is richly illustrated with dozens of color photographs. The enclosed free Audio CD contains recordings by native Korean speakers of all the vocabulary and sentences in the book, to allow you to practice pronouncing them. An introduction to Korean pronunciation and grammar is included and indexes at the back allow you to quickly look up the words in this easy-to-use Korean dictionary. Tina Cho is the author of The Girl's Guide to Manners and forthcoming books: Rice from Heaven and Korean Celebrations. Tina writes for the educational and children's markets. She lives in South Korea with her husband and two children while teaching at an international school.